The fees below reflect our care and attention to detail, from the selection of specialised cones to the vintage decoration of both the bike, the table and the attendant. These extra touches reallly make this a specialised service! If numbers exceed 100 please ask for a personal quote. If an area is outwith fife there will be a charge for travelling. as ice cream is sold directly to customers. A deposit of £100 is required to secure the time, date and place. The balance will be invoiced 14 days in advance of your event. held 40-70 mile from Glenrothes. held 70-100 miles from Glenrothes. Discounted rates for bookings between October to April! 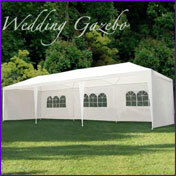 A smaller gazebo can also be supplied.